Windows Live Messenger 9.0 (2009) Beta Build 14.0.5027.908 was made available for download on September 17, 2008 as an integral piece of the Windows Live Wave 3 puzzle. Windows Live Messenger 9.0 is designed as the successor of version 8.5, which was finalized as a component of Windows Live Wave 2 and offered both leaked and officially starting with November 2007. By the end of November 2007, the first private Beta build of Windows Live Messenger 9.0 labeled as 9.0.1407.1107 was also leaked and up for grabs from various third party sources. Now with Build 14.0.5027.908, Windows Live Messenger 9.0 (2009) has reached the public beta stage. But at the same time, there are additional features delivered with this Beta, including Groups, What’s New Feed, Personalization, Photo sharing etc. 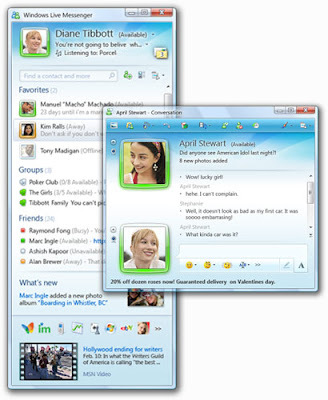 The graphical style and user interface of Windows Live Messenger 9.0 (2009) has evolved consistently compared to version 2.0. Users will be able to notice that the implementation of the new GUI spans from the main window of the new iteration of Microsoft’s instant messaging client all the way to the conversation window.In this regard, version 9.0 Beta offers notifications via the What’s New Feed feature every time a buddy makes modifications to their Windows Live Space, the display picture or their status. “Messenger has always had great ways to express yourself, but in the latest version we take it to a whole new level. Dynamic display photos, animated display photos, and hyperlinked personal status message URLs,… but the most dramatic feature has to be Scenes. Wait until you see it,” promised the member of the Windows Live Messenger team. In addition, Windows Live Messenger 9.0 (2009) Beta Build 14.0.5027.908 also permits end users to sign in from a variety of locations and from different devices simultaneously. To complete the experience, Microsoft has also improved the photo-sharing capabilities of the instant messaging client delivering two-way synchronization functionality. I hate the photo sharing function!!!! !